ALVARION is the world largest supplier of the equipment and solutions of wireless wideband infrastructure organization. Alvarion products represent the full spectrum of wireless wideband applications, beginning from fast-acting access and services of data and voice transfer in “last mile” to cost effective feeding channels of the basic stations of the cellular communication, possibility of communication “building to building”, and public wireless local network creation. PELCO is the world leading company, dealing with design, development and production of video control system and concurrent equipment. Among great number of producers of the equipment, Pelco is notable, as it is focused 100% of its activity on the new solutions in sphere of video control. Pelco Ltd. produces the full spectrum of equipment for video control system, allowing fulfilling technical solution of any scale. “Swarco Futurit ” is the biggest producer of high quality traffic lights, and also a leading manufacturer of information panels on the base of fiber-optic and LED technologies. This company has already gained the leading place as a supplier of road marking equipment on CIS and Europe market. AMERICAN FIBERTEK Inc. is the biggest producer of communication systems on copper and optical fiber. AFI presents innovative solutions in sphere of video data transfer for various safety systems. Over the last 18 years, the company gained reputation of the leading company for the quality of products and clients services. The company provides new solutions for video and digital data, designed specially for security systems industry. “Adaptive Recognition Hungary ” is a Hungary company, developing the unique equipment and software in sphere of OCR (optical character recognition). Products of the company take the leading place in the world in sphere of specialized equipment such as Passport Readers, Plate Recognition System, and Parking System. Hi-G-Tek . The main direction of its activity is development of products on the base of radio frequencies and wireless systems of remote monitoring. Hi-G-Tek company specializes on such type of technology beginning from 1996. Their activity includes not only elaboration of microelectronics, but also production process in a whole. 19 independent applications were patented, including application of electronic seals, vehicle direction control checkpoints and cargo control systems. Mettler Toledo is an international industrial corporation, the biggest manufacturer of weighting equipment and also analytic equipment for laboratories and production. Headquarters of the company is located in Switzerland , and its products are manufactured on factories in Germany , Great Britain , the USA and other countries. Mettler Toledo products are produced according to the international standards ISO 9001 and ISO 14001, they also patented by Gosstandard of RK and other contiguous countries, recorded in the State register of measurement devices. Barco Control Rooms Company is recognized leader, providing solutions for control rooms, used for broadcasting, telecommunication, production control, public utilities. High competence of Barco in projecting technologies, its leadership in industrial design, management software and controllers for display walls and basing on the years of experience, Barco can realize any Room Control Project. Solutions of Barco Control Rooms are assigned for use within 24/7 environment. The company provides services and parts' supply, even when goods were taken out of production. Continuous researches and proven flexibility towards customers' requirements are the best guarantee of the income, obtained from the investments into Control Rooms. Competence in projecting technologies, leadership in sphere of design, management software and controllers for display wall management, development of the projects and wealth of experience allow Barco Control Rooms to act as the single partner for each project of Control Room. Today, with more than 34,000 employees worldwide, Cisco remains committed to creating networks that are smarter, thanks to built-in intelligent network services; faster, in their ability to perform at ever-increasing speeds; and more durable, with a generational approach to an evolutionary infrastructure. Group of Magal Companies, which is exclusively represented by the company NTC-NT on the market of the Middle Asia, offers wide range of safety system products and services worldwide. High performance perimeter security systems are currently used worldwide, protecting borders, airports, royal palaces, presidential residences, correctional facilities, nuclear power stations and many other sensitive sites. Magal offers complete technical support for their products, including system design and site planning, project management, on-site installation supervision and commissioning, training for Customer's staff, documentation, maintenance and factory warranty and repair. As the world's leading supplier of outdoor perimeter products, the company specializes in reducing the risk of theft, vandalism, harm, sabotage, kidnapping and escape. Magal Group offers a broad choice of intrusion detection technologies in the most cost-effective product range available. A high probability of detection, comparing with the similar systems, existing on the market at present time. The lowest frequency of false alarms and nuisance alarms, comparing with the similar systems, existing on the market at present time. Ability to receive alarm signal in the early period, increasing speed of the security's response. Minimum dependence on the human factor, which is replaced by reliable systems. SPC "ASPECT". The Scientific Production Center ASPECT was established in July 1991 on the basis for the Joint Institute for Nuclear Research (Dubna). Now Aspect leads Russia in development and production of modern professional spectrometric, radiometric, and radiation-monitoring equipment. The scientific and designing departments of Aspect are staffed with highly skilled personnel broadly experienced in nuclear instrument making. NUCTECH COMPANY LIMITED (NUCTECH), founded in July 1997, is a prestigious high-tech company originated from Tsinghua University. 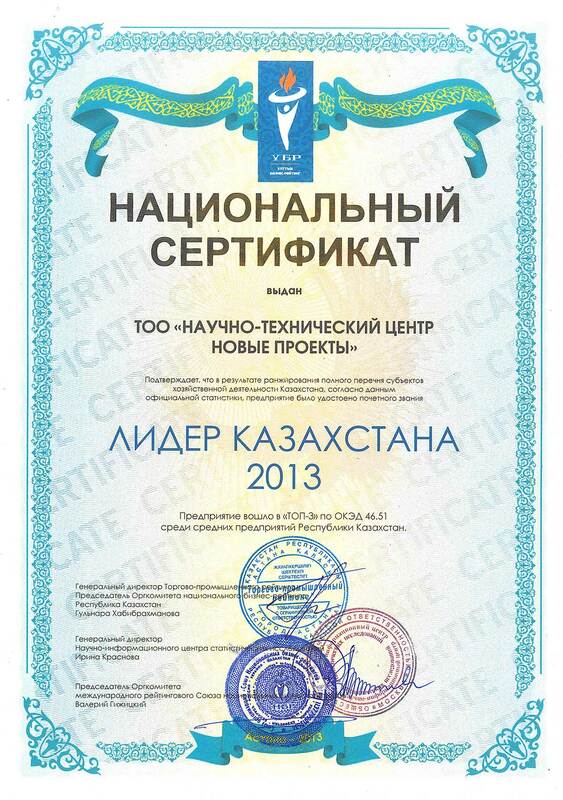 Company “Novgorod’s plant GARO” works since 1957, and is the leader on the market of equipment for service center. The Company with the leading European producers in the joint projects develops, produces and delivers the diagnostic lines and the braking test benches for state tech inspection, and also service center’s equipment for the following areas: braking test benches and diagnostic lines, packages of the motor diagnosis, the test benches for testing and control of electrical equipment, system car’s scanners, the gas analyzers and smokemeter, the analyzers of backlash, the autohoists, the tyre changers, the balancing apparatuses, the apparatus for the sparking plugs cleaning, the apparatus for the injector cleaning, mechanisms for the removal of the exhaust gases and other equipments. This equipment of Company “Novgorod’s plant GARO” is presented by closed joint-stock company “GARO-trade” The wide branch of dealers and service centers let us call the as the leading Russian manufacturer and supplier of equipment for auto service. The wide branch of dealers and service centers lets to call the Company “Novgorod’s plant GARO” as the leading Russian manufacturer and supplier of equipment for auto service. Integra-S consortium is one of the leading Russia companies in creation of intelligent integrated security systems and systems for object management. The basic activities of the company are: creation of complex security and object management automation systems - from designing to mounting and post-warranty service. ARX (Algorithmic Research) is a global provider of cost-efficient digital signature solutions for industries such as life sciences, healthcare, government, and engineering. CoSign® is a digital signature solution that takes a better approach. CoSign makes it easy to digitally sign transactions, documents, and records. This Portable Signature Format (CoSign PSFTM) allows anyone to seamlessly verify and retain proof of identity and document integrity without costly, complicated, or proprietary software. As a result, CoSign keeps your business running smoothly by fully automating and quickly scaling processes at a low cost and with proper controls. SICK- one of the world's leading producers of sensors and sensor solutions for industrial applications. SICK is a technology and market leader in Factory and Logistics Automation as well as Process Automation. Development of sophisticated intellectual sensors and sensor systems, designed for automation of technology and factory processes is one of the main activities of SICK company. Constant integration of advanced technologies and elaborated price policy provide SICK the leading position on world market. Besides, SICK integrates the most advanced technologies by development and manufacture of color, contrast and ultrasonic sensors, inductive and magnetic sensors of target approach and intellectual sensor cameras. IPC2U company is one of the leading supplier of industrial automation and telecommunication. failsafe computers, periphery elements, integrated systems, communication devices, industrial robots, etc. S.T.I. ltd (Security Technology Integration) operates in the development and marketing of solutions & systems for the Homeland security & Homeland Defense Global Market. All S.T.I. systems are manufactured from high quality and durable materials, are cost effective products combining the ergonomic design and a friendly user interface. STI's systems comply to ISO 9001:2008 requirements and are registered as patents in the U.S and around the world.